ARROW VIDEO SAYS, DON'T BE SCARED, BE PETRIFIED!!! Out of this months selection of new releases from Arrow Video, why don't you treat yourself to a film where children play with corn while ducks get tortured? Or better yet, how about a movie where blood becomes the main course while a possessed homeboy gets his revenge? Want to know what I mean by this? Then check out the following collection of cinematic gems which I'm sure will blow your mind. Blow it till the sun don't shine, baby. Go on, do it if you've got the guts. Picture the scene: A young couple go on a road trip and unfortunately find themselves lost in the backroads of rural Nebraska. While there, they mistakenly come across a seemingly abandoned town, named Gatlin, only to discover that this town is far from being empty, as it's inhabited by a twisted cult of murderous children, thirsty for another blood sacrifice. Adapted from a short story written in 1977 by the celebrated horror author, Stephen King, Children of the Corn stars Linda Hamilton (The Terminator) and Peter Horton (Crimes of Passion), and has since gone on to spawn one of the most enduring horror franchises of all time. 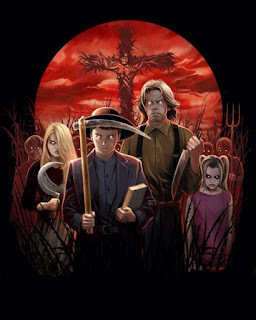 Brand new audio commentary with horror journalist, Justin Beahm, and Children of the Corn historian, John Sullivan. Audio commentary with director Fritz Kiersch, producer Terrence Kirby, and actors John Franklin and Courtney Gains. Harvesting Horror - retrospective documentary featuring interviews with Fritz Kiersch, John Franklin and Courtney Gains. It Was the Eighties! - an interview with the actress Linda Hamilton. And a Child Shall Lead Them - a brand new interview with the actors Julie Maddalena and John Philbin. Field of Nightmares - a brand new interview with writer George Goldsmith. Stephen King on a Shoestring - an interview with producer Donald P. Borchers. 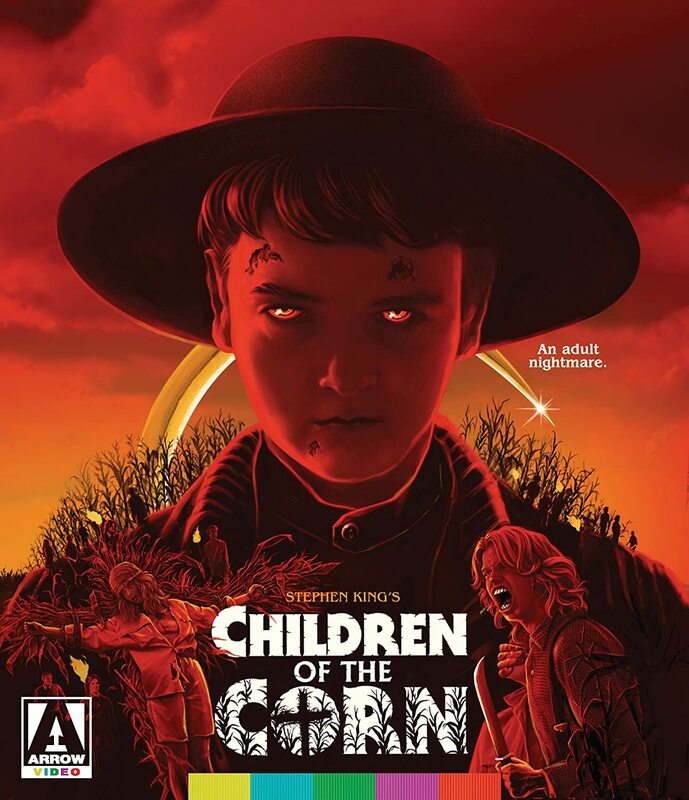 Welcome to Gatlin: The Sights & Sounds of Children of the Corn - interviews with production designer Craig Stearns and composer Jonathan Elias. Return to Gatlin - a look back at the iconic filming locations in Iowa with host John Sullivan. Cut From the Cornfield - an interview with actor Rich Kleinberg on the infamous "lost" Blue Man Scene. Disciples Of the Crow - 1983 short film adaptation of Stephen King's story. Reversible sleeve featuring original and newly commissioned artwork by Gary Pulli. Release Date: 26th of September, 2017 / Genre: Horror / Running Time: 92 minutes / Number of Discs: 1 / Audio: Stereo / Language: English / Subtitles: English SDH. When the sleepy rural village of Accendura is rocked by a series of brutal murders, most of them focused on young boys, the superstitious locals are quick to assign blame onto the neighborhood "witch", as played by Florinda Bolkan (A Lizard in a Woman's Skin). But thankfully, among this mess, two outsiders are willing to stand up and finally find out what is going on. One of them is a city journalist played by Tomas Milian (The Four of the Apocalypse), where as the other is a spoilt rich girl played by Barbara Bouchet (The Red Queen Kills Seven Times), and together, they decide to team-up and crack the case before more blood is spilt, not all of it belonging to innocents. 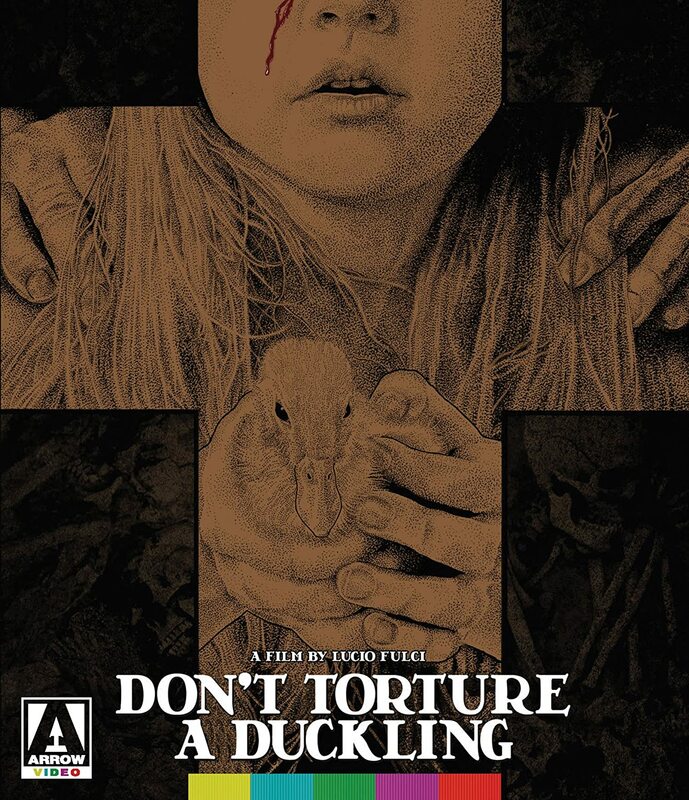 Deemed shocking at the time for its brutal violence, its unfavorable depiction of the Catholic Church, and themes of child murder and paedophilia, Don't Torture a Duckling is widely regarded today as Lucio Fulci's greatest film, rivaling that of his other works, which include The Psychic and The Beyond, as well as those developed by his close rival, Dario Argento. The Blood of Innocents, a new video discussion with Mikel J. Koven, author of 'La Dolce Morte: Vernacular Cinema and the Italian Giallo Film'. Every (Wo)man Their Own Hell, a new video essay by critic Kat Ellinger. Interviews with co-writer / director Lucio Fulci, actor Florinda Bolkan, cinematographer Sergio D'Offizi, assistant editor Bruno Micheli, and assistant makeup artist Maurizio Trani. Release Date: 3rd of October, 2017 / Genre: Horror / Running Time: 108 minutes / Number of Discs: 2 / Audio: Mono / Language: Italian / Subtitles: English SDH. Dorothy Fremont is looking to throw a party unlike any other she has thrown before, and to do this, she hires the decidedly sinister Fuad Ramses to cater the event. For his services he promises to provide her guests with an authentic Egyptian feast, and promptly sets out to acquire all of the necessary ingredients, including the body parts of nubile young women! 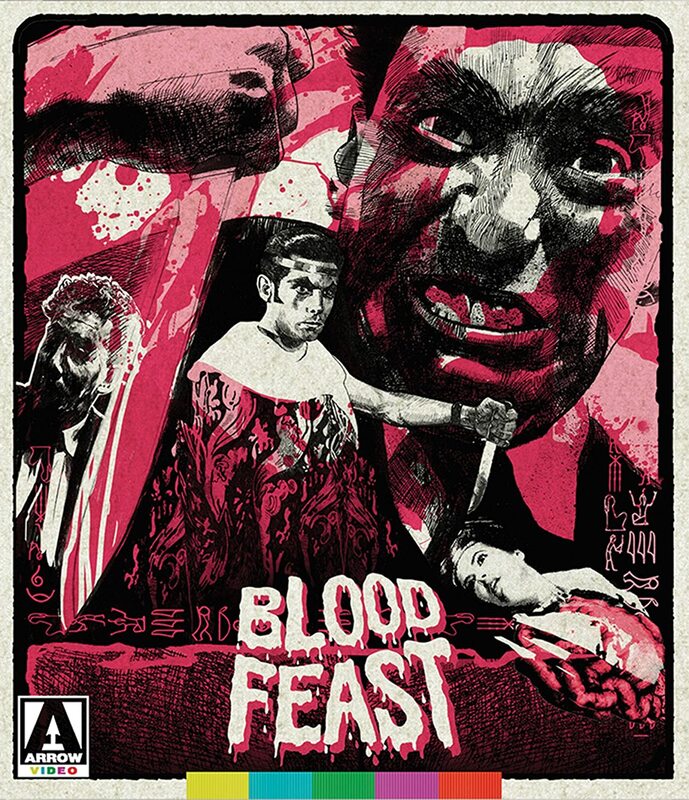 Blood Feast features a whole host of stomach-churning gore, gags, and gruesomeness, such as the infamous tongue sequence and much more nastiness besides. In many ways this is one of the best films directed by Herschell Gordon Lewis, and it more than lives up to its name and remains essential viewing for any self-respecting splatter fan. Scum of the Earth - Herschelll Gordon Lewis' 1963 feature. Blood Perspectives - Filmmakers Nicholas McCarthy and Rodney Ascher on Blood Feast. Herschell's History - Archival interview in which director Herschell Gordon Lewis discusses his entry into the film industry. How Herschell Found his Niche - A new interview with Lewis discussing his early work. Carving Magic - Vintage short film from 1959 featuring Blood Feast Actor Bill Kerwin. Alternate 'clean' scenes from Scum of the Earth. Promo gallery featuring trailers and more. Feature length commentary featuring Lewis and David F. Friedman (moderated by Mike-Grady). Reversible sleeve featuring original and newly-commissioned artwork by Twins of Evil. Release Date: 10th of October, 2017 / Genre: Horror / Running Time: 67 minutes / Number of Discs: 2 / Audio: Stereo / Language: English / Subtitles: English SDH. One night, while enjoying himself with his friends, Ike, a law student, becomes possessed with the spirit of a violent gangster when he takes part in a hypnosis act, held inside a nightclub. So now believing himself to be the reincarnation of the murderous J.D., who was killed way back in the 1940s, Ike launches a revenge campaign against those who had done 'him' wrong all those years ago. Directed by Arthur Marks (Bucktown) and starring Glynn Turman (Cooley High) and Academy Award-winner, Louis Gossett Jr. (An Officer and a Gentleman), J.D. 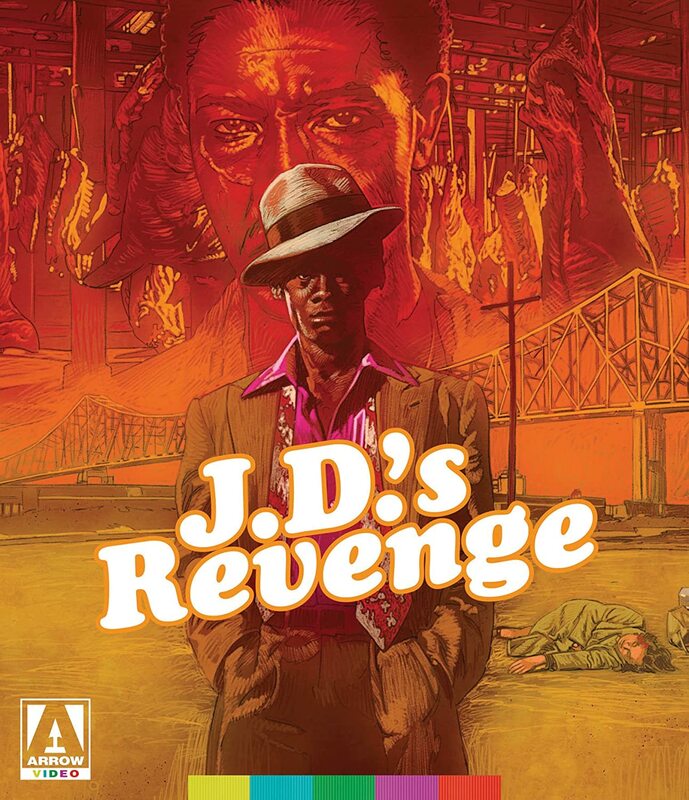 's Revenge is a Blaxploitation gem waiting to be rediscovered! So do it, baby, get your groove on. Brand new 2K restoration from original film elements, produced by Arrow Films exclusively for this release. Brand new interview with producer-director, Arthur Marks. Release Date: 31st of October, 2017 / Genre: Horror / Running Time: 96 minutes / Number of Discs: 2 / Audio: Mono / Language: English / Subtitles: English SDH. This film is adapted from a novel written by Ermano Cavazzoni, and it begins when a character played by Roberto Benigni (Life Is Beautiful) is released from a mental hospital, only to fall in love with a kind young lady named Aldini (Nadia Ottaviani). As he then attempts to win her heart, he wanders a strange, dreamlike landscape, and encounters various oddball characters along the way, such as Gonnella (Paolo Villagio), a paranoid old man prone to conspiracy theories. 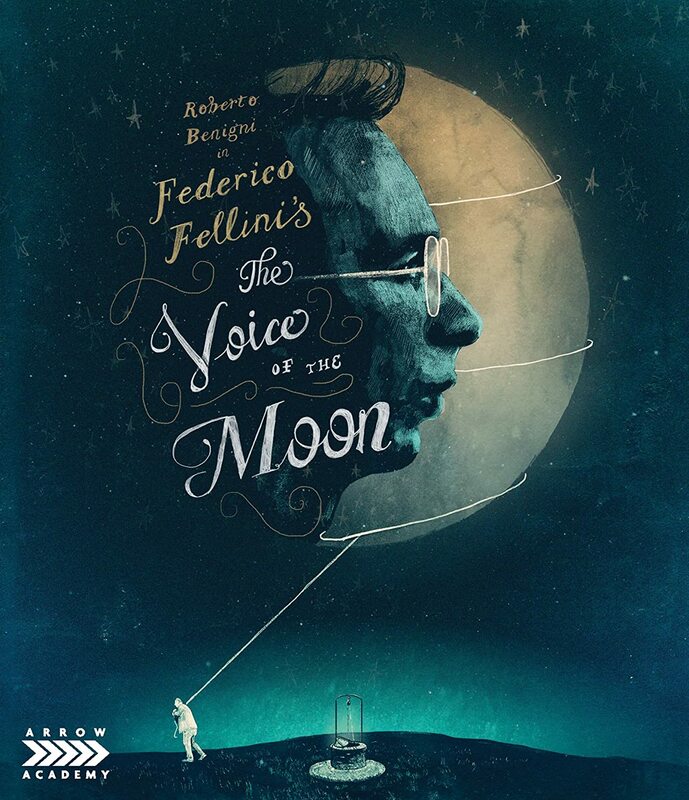 Concluding a career that had stretched back more than fifty years, The Voice of the Moon combines the nostalgia of many of the other films made by the great Italian filmmaker, Federico Fellini. This includes Amarcord (as the film is set in Emilia-Romagna, more specifically the countryside where the director spent most of his youth), as well as City of Women (encapsulating the surreal satire and brutal-world structure of La strada). Original 1.0 mono sound (uncompressed on the Blu-ray). Towards the Moon with Fellini, a rarely seen hour-long documentary on the film's production, featuring interviews with Fellini, Roberto Benigni, and Paolo Villagio. Release Date: 31st of October, 2017 / Genre: Drama / Running Time: 121 minutes / Number of Discs: 2 / Audio: Stereo / Language: Italian / Subtitles: English SDH.